106 girls got ready for our company. There was about fifty here and we did have a splendid time. 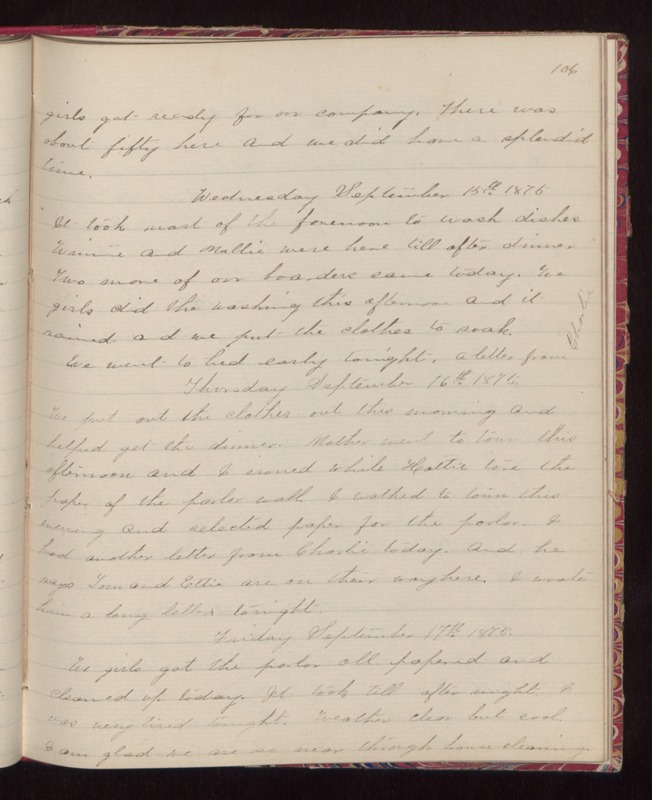 Wednesday September 15th 1875 It took most of the forenoon to wash dishes Winnie and Mollie were here till after dinner. Two more of our boarders came today. We girls did the washing this afternoon and it rained and we put the clothes to soak. We went to bed early tonight. A letter from Charlie. Thursday September 16th 1875. We put out the clothes out this morning and helped get the dinner. Mother went to town this afternoon and I ironed while Hattie tore the paper of the parlor wall. I walked to town this evening and selected paper for the parlor. I had another letter from Charlie today. And he says Tom and Ettie are on their way here. I wrote him a long letter tonight. Friday September 17th 1875. We girls got the parlor all papered and cleaned up today. It took till after night. I was very tired tonight. Weather clear but cool. I am glad we are so near through house cleaning.